So what does the “c” stand for? Color is the real answer. The 5c is available in five of them. The default wallpaper will now match the color of the phone exterior. 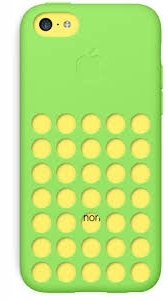 Plus there’s a cool-retro new line of color matching cases. Cheap could be another answer. Well, cheap-ish. At $99 for a 16GB version or $199 for a 32GB (with two year contract), the 5c is the least expensive new iPhone ever launched. It’s also the first iPhone with a somewhat cheap-feeling plastic outer shell, albeit one that’s steel reenforced. To Spot Cool Stuff, the “c” should be for consistent. Because, really, the iPhone 5c is basically an iPhone 5 in a different package. The specs are similar to an iPhone 5. The 5c has a new A6 chip and a slightly improved camera and audio quality, but substantially it’s the same phone. In fact, with the introduction of the 5c, the iPhone 5 will no longer be on the market. Should you upgrade to an iPhone 5c? Almost certainly not. If you are upgrading to anything it will probably be to the iPhone 5s (see below) which costs only $100 more than a 5c. Or, if you have a really old iPhone and want something better but find a new 5s outside of your budget, consider getting an iPhone 4s which (with a new 2-year contract) will now be the best price of all: free. 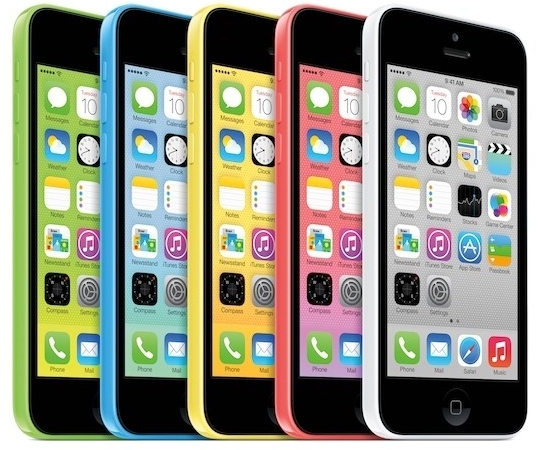 However, if you are looking to buy a tween or high school student their first iPhone, the 5c is perfect. Younger students, especially, will like the colors and the personalization options. 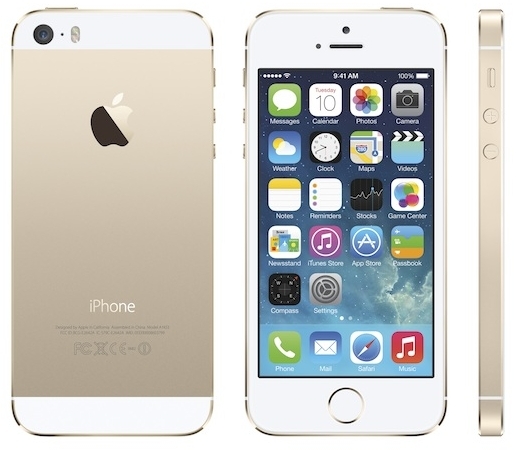 The new iPhone 5s is available in three new colors: very dark grey, gold and champagne. And there are three major new features: a new chip and co-processor, new camera features and fingerprint security. The new chip, an A7, has 64 bits. This makes the iPhone 5s the world’s first 64-bit smartphone. The chip is backwards compatible with the apps you currently have on your iPhone — it’ll just run them faster. After the next generation of 64-bit apps come out you’ll really notice the difference, not only in terms of speed but in app complexity and graphics. In a bid to make the chip set in the new iPhone sound like the highway system around London, the A7 will be paired with an M7 chip. It’s a specialty motion co-processor that will run things like the accelerometer, gyroscope and compass. The speculation is that the M7 will eventually link the iPhone 5s to a future wearable tech device, which might possibly an iWatch, which might possibly launch in October. The new 5s camera features are, at least in part, only new for iPhone users. The larger sensor, the slow-motion 120 frames-per-second video and the burst mode (wherein the camera takes a bunch of shots and then automatically chooses the best one to keep) have been available on certain Android and Windows phones for some time. There’s also a new 5-element Apple-designed lens with an f/2.2 aperture. Spot Cool Stuff never uses a camera flash when we can help it and even we’re intrigued by the iPhone 5s’ new TrueTone flash. It measures the color of the scene being photographed and then chooses the best of 1,000 different flash colors to illuminate it. The idea being that the flash won’t horribly discolor your low light shots — or, at least not as much. 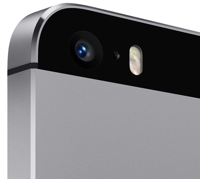 The iPhone 5s’s camera is still 8mp. Some other smartphones, mostly noticeable the Nokia Lumia 1020, have gone the route of improving camera quality by bumping up the number of megapixels. That’s perhaps the better way to go if your smartphone is your only camera. Spot Cool Stuff, being an enthusiastic user of “real” cameras, prefers the Apple philosophy keeping the same number of pixels but increasing their size. (The pixels on the iPhone 5s are a large 1.5u though that still isn’t as large as the 2.0u pixels on the HTC One.) The bigger the pixels the better the photo. 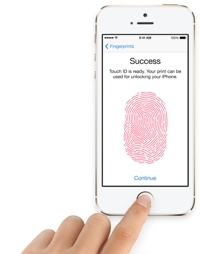 The new fingerprint security, dubbed Touch ID, is by far the coolest new iPhone feature. Simply place your finger on the home button and the screen unlocks. (No more swiping). Fingerprints can also be used to approve purchases from the iTunes store and other online shopping — a huge step towards moving beyond passwords. Can we get an amen! All reports are that the fingerprint security works brilliantly. The unobtrusive scanner is speedy and you needn’t place your finger on it exactly right for the print to be recognized. Plus, the iPhone 5s can store up to 10 people’s prints. We anticipate future software updates that lets different users have their own profile that would automatically launch at start up. Every new iPhone is faster than the model it replaces. Every new iPhone has an improved camera. But what Spot Cool Stuff really wants in a new iPhone is what most other people want too: a larger screen and significantly longer battery life. It is disappointing that the iPhone 5s offers neither of those. That said, there is one huge reason to upgrade to a iPhone 5s: the Touch ID fingerprint security. Some people are unnerved by their smartphone scanning their fingerprint and by how that moves us another step closer to the world of Minority Report. We’d argue that world is coming, whether you upgrade to the new iPhone or not. Given all the personal information your phone has about you — where you go, what music you like, where you bank and how much money you have, etc — having your fingerprint seems relatively benign. On the other side of the equation, if you’ve ever had your phone stolen you know how invasive that is. Apple is already at the forefront of phone security (with their remote data wipe feature, for example). 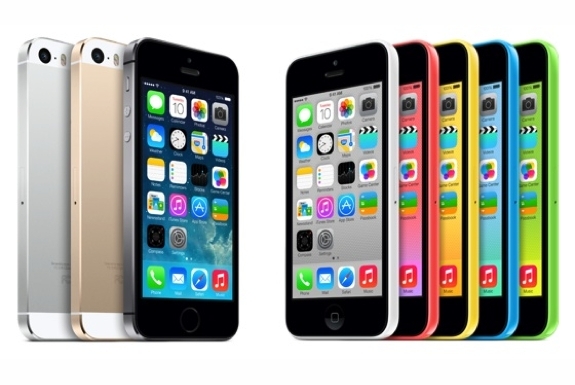 The iPhone 5s is easily the world’s most secure smartphone on the consumer market today. If that security appeals to you, we’d suggest upgrading to the iPhone 5s. If not, feel free to stick with your iPhone 5 or 4s — at least until the iPhone 6 comes out (rumored to be October of 2014). As more apps are written for 64 bits, you’ll essentially have to upgrade by then if you want to stick with iPhone. Not that you have to stick with iPhone. Apple is no longer the leader in smartphones. It isn’t a follower either, but with so many good options out there it is worth at least considering them if you are out of contract. The Samsung Galaxy S4 and Nokia Lumia 1020 are among Spot Cool Stuff’s current favorite iPhone alternatives. Well personally Im over the iphone.. Apple has maintained the pay for everything mentality unlike many of the competiters and its suffering. The world knows as does apple that the iphone is saturated and android has taken over. Finger print scanners are far from relia le and it certaiy doesnt warrent a change in your current phone for new offerings. My S3 litterally blows tbe iphone away with usable features and functions. My upgrades come automatically were appls seems to want to make you buy. A new phone to get upgrades… so my pondering question is … if these new offdrings are cheap.. but basically the same phone.. why was the original so expensive and why is this one now so cheap… I smell recycled phone parts.